Apple iPad brings eBook fans a new level reading experience, especially the full-featured iBooks app coming with this iDevice. You are a proud owner of iPad and at the same time, you just save numerous eBooks in various formats like PDF, MOBI, DOC, TXT, etc. However, we should face the fact that the default eBook format for iBook is ePub. Although you can read PDF, DOC, TXT on iPad, the reading experience is not as good as ePub. That is main reason why we need to convert files to ePub format. Suppose you have a huge number of eBooks saved on your Mac OS X, and want to batch convert them to ePub for reading on iBooks. You need to find efficient Mac ePub Converter software. Here I would like to recommend Coolmuster ePub Converter for Mac, which allows you to rapidly convert 5+ popular file formats, such as PDF (.pdf), Microsoft Word (.doc), Text (.txt), HTML (.htm, .html), MOBI (.mobi), etc., to ePub format, with the original styles and format retained. 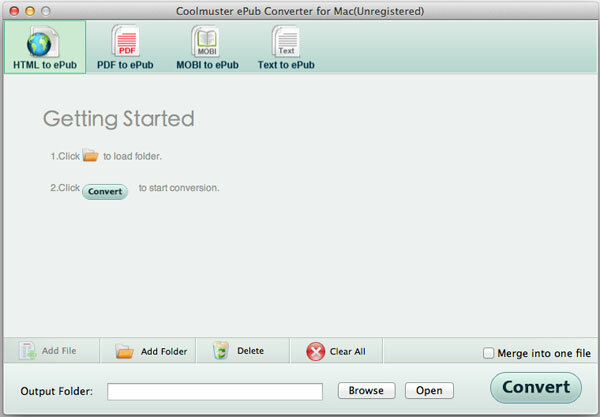 With this powerful Mac ePub Converter, you can make ePub on Mac with a few clicks. Try ePub Creator for Mac! If you have a Windows PC, you can try ePub Converter for Windows as well. Launch the Mac ePub Converter and you will see the main interface of the program like below. The Mac tool provides you with 5 conversion types, including HTML to ePub, Word to ePub, Text to ePub, MOBI to ePub and PDF to ePub. Just choose your needed conversion type and drag & drop corresponding files to the program. Select an output folder to save the created ePub files by clicking the "Browse" button on the bottom of the program if you do not want to save the output files into the source folder. Tips 1: If you want to combine multiple imported files into one single ePub file, you can check the option "Merge into One File". Tips 2: When you choose to create ePub from PDF, there are two conversion modes: Text mode and Image mode. Click the Start button to start the ePub creation. If you change your mind and do not want to convert all imported files to ePub, you can right-click on specific file, choose "Convert Selected" from the drop-down menu and convert it to ePub format separately. In a few seconds, you can find the created ePub files in the output folder. Quite easy, right? Now you can easily transfer the ePub eBooks to your reading devices for reading on the go.